Dallas Buyers Club — the real-life story of a dissolute Texas homophobe who in 1985 was diagnosed with AIDS — has been written about almost exclusively in terms of its two stars: Matthew McConaughey and Jared Leto. That’s understandable, given the truly amazing performances each gives. McConaughey plays rodeo cowboy and electrician Ron Woodroof, and Leto plays Rayon, a transvestite who becomes an unlikely friend to Woodroof, as well as a business associate of sorts. Just a good ole boy. Can he change? It’s impossible to write about Dallas Buyers Club without mentioning that the movie caps a transition in McConaughey’s career — from promising pretty boy to a full-fledged character actor who can be eccentric, fearless and unnervingly immersive. 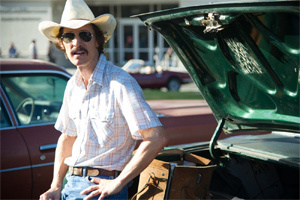 McConaughey’s engine always seems to be running at high speeds, even when he’s idling. To play Woodroof, McConaughey reduced himself to skeletal weight, unflinchingly embraced the ugly side of Woodroof’s character and wound up offering a piece of performance-art caliber acting that poses a seldom-debated question: How much can experience really change a person? Can a good-ole Texas boy, with a proclivity for drugs and hookers, develop unexpected sensitivities? How far in that direction could he possibly go? How would it look if he did begin to see the world through different eyes? To McConaughey’s and the film’s credit, Dallas Buyers Club never totally files away Woodroof’s rough edges: His bigotry, his boundless capacity for hustling and his unapologetic self-absorption remain constant throughout. If you’re familiar with Leto — i.e., if you know what he looks like — you’ll find him unrecognizable as Rayon, a transvestite who forms an initially uneasy alliance with Woodroof. Woodroof and Rayon meet in a hospital, after both have been diagnosed with AIDS. Rayon approaches the wary Woodroof, and as the movie progresses, it becomes increasingly clear that Leto has put himself as far out on an emotional limb as McConaughey. He’s playing a good-hearted character whose AIDS leads him down a path of heightened self-destruction. Woodroof develops a personal connection to Rayon, but he also sees an opportunity to cash in on other people’s troubles. After he visits a rogue doctor (Griffin Dunne) in Mexico, Woodroof finds a way around U.S. law. He sets up a club that allows him to import and provide vitamin concoctions that Dunne’s character dispenses. Club members pay dues: The drugs are free. Woodroof initially was told he could expect to live another 30 days. The movie suggests that abandoning AZT and switching to an entirely different drug regimen allowed Woodroof to live another seven years. Not surprisingly, Woodroof’s new business venture puts him in conflict with the DEA, FDA and other government agencies. It also allows him to find a measure of unexpected fulfillment as a drug entrepreneur. McConaughey amply conveys Woodroof’s delight in running a burgeoning business. He might be the only person in the world whose disease resulted in an ego boost. Two major figures represent the medical community. Denis O’Hare plays a doctor in charge of AZT trials at a Texas hospital. Jennifer Garner portrays another doctor, a physician who begins to understand that rules promulgated by the medical establishment may actually be harming patients. Dallas Buyers Club seems to want to give us insights about AIDS, about the perils of early treatments with AZT, about the blind recalcitrance of the FDA, about the bureaucratic foolishness of the DEA and about the ways in which helpful potentially alternative medicines have difficulty finding their way into the mainstream. I don’t know what director Jean-Marc Vallé intended, but his actors tend to overwhelm the medical issues at the movie’s core. I have no problem with that: Some of those issues have been explored elsewhere. Besides, McConaughey and Leto have done what movies do best. They’ve given us a couple of unforgettable characters.